So what are the implications for management? What new concepts and values are being introduced? How is executive power being eroded? What are the risks and benefits of increasingly open systems? What can managers do to ensure a smooth transition to a more innovative, collaborative working environment? The book is distilled from interviews with more than 50 thought leaders in the social web: executives at Google, Yahoo and Salesforce; developers at MySpace and Microsoft; and web pioneers like Tim O'Reilly and Craig Newmark. It is packed with insights from CEOs of small, savvy start-ups, as well as lessons from senior staff from multinationals like British Telecom, Ford, IBM and Shell. The book looks at Twitter, Facebook, LinkedIn and other social networking sites, blogging and microblogging, social bookmarking, crowdsourcing and other social media. It addresses their true impact on the workplace, in terms of creativity, knowledge-sharing, transparency, customer feedback and open innovation. It explains exactly what managers can do to ensure a smooth transition to a more creative, collaborative working environment. 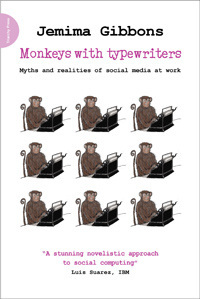 Monkeys with Typewriters identifies key behaviours in social media and relates these to current business practice. These behaviours are proposed as a practical framework, which can be actively applied to create happier, more productive organisations. The glossary will be especially useful for newcomers to social media and also provides valuable reference material for the more experienced. This is a book for leaders and managers looking to understand the impact of social media at work and hoping to get an idea of how their colleagues are addressing the many issues raised in the process. It’s also a key source for researchers in this area.